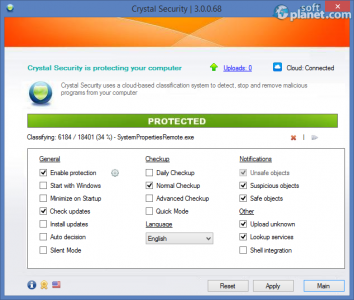 SoftPlanet makes it possible for everyone to get free Crystal Security download directly from our servers. There is no registration needed for downloading. Crystal Security 3.0.0.68 is a cloud-based security solution that can detect and remove malware. It comes with real time protection, so you will be informed about your PC condition at any time. Probably its freeware license is the best thing about it, so you don't need to pay anything in order to be protected. Crystal Security 3.0.0.68 might not be the first cloud-based security solution on the market, but it probably is the first one, which is completely portable, so you don't have to install anything. I know that it sounds crazy, but it's true. The app is very tiny as well. What the app actually does is to collect data from millions of participating user systems around the world to help defend you from the very latest viruses and malware attacks. In addition, Crystal Security 3.0.0.68 can be updated both automatically and manually. You are even able to choose between 10 different languages: English, Estonian, French, German, Serbian, Polish, Croatian, Turkish, Hungarian and Azerbaijani. Crystal Security 3.0.0.68 comes with an extremely simple and easy-to-use interface. There are only a few buttons, which give you instant access to most needed features actually. The utility has interesting navigation as well. The main buttons are placed at the bottom of the app window. If you click on a particular one, the only things that will change are the content of the pane above and the navigation buttons. In order to go back, you simply need to click on the Main button. As you have already understood the application is completely portable. Crystal Security 3.0.0.68 really works very smoothly. However I cannot feel that my system is protected, if the size of my security solution is smaller than 1 MB. It just doesn't look very reliable. Don't you think? The nag screen is the next thing that I do not like about this app. It scans all currently running processes and asks you to choose between the following actions: Allow object, Quarantine object and Deny object. It even scans itself. Crystal Security 3.0.0.68 is an interesting free and portable project for cloud-based security solutions. However I really don't think this is proper protection for your PCs. There are many other more powerful products on the market, which you can get for free as well. Our security scan shows that Crystal Security is clean from viruses. The current version of Crystal Security has been scanned by our system, which contains 46 different anti-virus algorithms. That ensures that Crystal Security 3.0.0.68 is 100% safe for your computer.